Teaching and Tapas has invited me to do a guest blog on her website! What an honour and what a great opportunity! The post went live today! "I have been a substitute teacher for almost 6 years now and have taught every grade between Kindergarten and Grade 12, in both French and English. Although I would much rather have my own classroom, teaching jobs are very scarce in Ontario right now, so I feel lucky to even be on not only one, but two occasional teacher lists. Over the years, I’ve seen many different classrooms, styles of teaching and lesson plan layouts. I’ve been in classes where there were no lesson plans left whatsoever and I had to improvise. I’ve also been in classes where the teacher had left 6 pages worth of lessons and a binder full of instructions to follow, and that was only for one day! 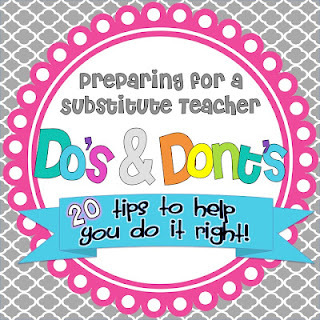 You may think that the more details you give, the better it is for your substitute teacher, but that’s not always true. The more there is to read, the more chances your sub will get overwhelmed and misinterpret something. Stick to what’s necessary only. There are things that only another substitute teacher can tell you when it comes to leaving your class for a day." To read more, click the link below and pick up your FREEBIE while you're there!